Here is a state by state list of locations with attempted or possible strikes or protests occurring on the inside. It will be at least a week before we have a good idea of what all has actually occurred behind bars this weekend. Prison administrators do not understand nonviolent resistance, so they tend to respond to any significant strike activity as they would a riot. Many units have been and will be put on lockdown, which means no one works, so it serves the same result as a strike. But, it also means phones, mail and communication access will be disrupted, preventing most prisoners from contacting us to let us know what is happening. To address this, IWOC is asking that people on the outside start calling prisons in their state to see if they are on lockdown. We shouldn’t assume that every lockdown is strike-related until we hear confirmation from prisoners, but we also should not believe prison staff’s stories about why the facilities are locked down. As the lockdowns are lifted, we will regain contact and start getting a better picture of what has happened and where the strike is occurring. Ongoing support for prisoners in facilities on strike is essential. September 9th is just the first day of a sustained direct action whose impact grows with every day the prisoners maintain it. In the meantime, the above list is what IWOC was able to cobble together based on news reports, rumors and those phone calls. We will be updating it as we gain information. Please organize solidarity actions (especially at the prisons themselves) with any location with a confirmed strike going on. In many places, alleged strike or protest leaders have been identified and attacked by the prison authorities. Here is a list of prisoners who have been thrown in the hole or otherwise attacked and a list of numbers to call to defend people. Please send mail to these prisoners and make these calls, on a regular basis. If you fill in the field at the end of the phone zap list, you’ll get occasional reminders to keep calling. If you have any information to add to these lists, or are willing to do some research to gather such information, please email iwoc@riseup.net. Please also remember these other ways to support! 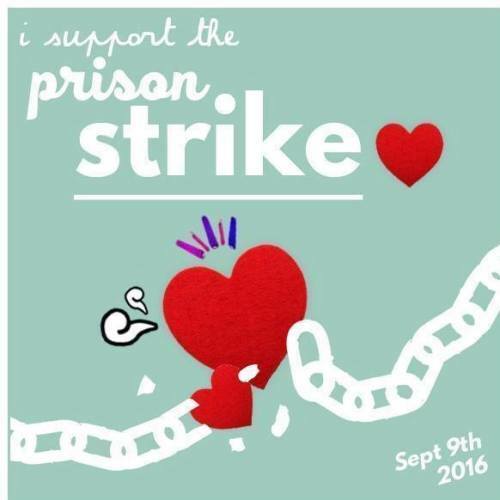 This entry was posted in General and tagged september 9, strike, support action, work stoppage on September 1, 2016 by Prisoner Support.